It's been 211 days since I last posted on, Care's Kitchen. Life's been busy. So here we are...now what? In 2013 I want to do better. I want to be a better mom, a better friend, a better sister, daughter, wife and neighbor. What's it all for, if not for those around us we love. I want to remind myself to be thankful for every day and to (at times) stop and take in the little things that make an otherwise ordinary day ....special. On a very positive note, I'm excited to let you know I was contacted by the editors at the website, SheKnows to be a contributor to their Food and Recipes section. It's been a wonderful opportunity for me to make some extra money doing what I love to do ~ cook and photograph food! Thanks to those of you who have stuck with me during my months off. From here on forward, I will post when I can and link to my posts on SheKnows. 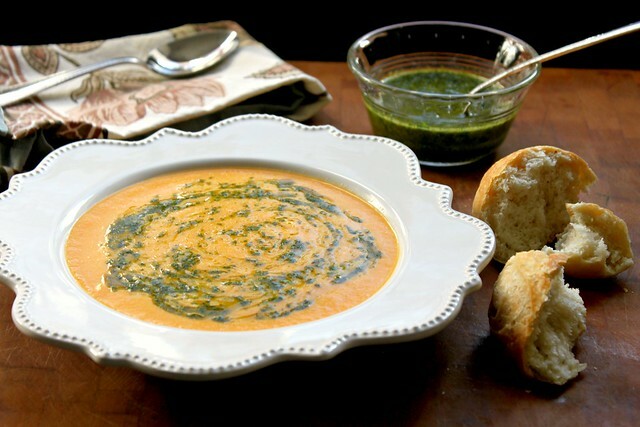 Let's start with this Carrot Ginger Soup with Hot Chili Cilantro Oil. I've made it four times over the past month ~ it never disappoints! Here's to great things ...and great food in 2013! Thank you all! Welcome back! You were missed very much. I love your new outlook on 2013 and can't wait to see your contributions to She Knows. Congrats! I made this and am eating this for lunch today! It is SO yummy and warm on this very cold day. Thank you for making great food!